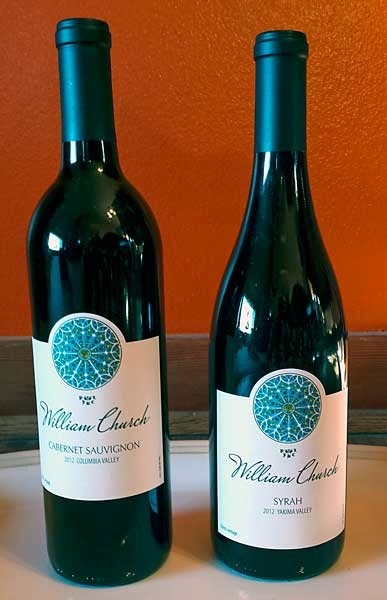 Friday night The Cork and Tap, in Coeur d'Alene, held a tasting event featuring wines from the William Church Winery located here in Washington State. In addition to the wine, winery owners Rod and Leslie Balsley were on-hand to answer any questions patrons had. All four of these wines from the William Church Winery, were hands down, the best wines we've ever tasted. In fact we enjoyed them so much we brought home a bottle of both the Syrah and the Cabernet Sauvignon to review on isitworthit.guru in the coming month. Turnout for the event was a bit light, but that gave time to talk one-on-one with Rod. I learned a great deal about wine and wine making, it was a lesson I'll soon not forget. I've personally been on a quest to find a red wine that I like most of my adult life. Until The Cork and Tap opened it's doors I've had no success at all. The Cork and Tap owner's Mike and Trish, both know wine and I've learned more the last few months than I have the previous 30 years. The Cork and Tap offers daily wine tasting and they have four beers on tap at all times. Paying them a visit is worth the trip from Spokane to Coeur d'Alene. Keep an eye on their social media accounts for the next event, or heck just stop on buy. Is Death Wish Coffee, The World's Strongest Coffee? I really have no idea, but I do know this; it brews into a great cup! When you first sip this coffee there's a raw and rugged, punch that hits you square in the mouth. But then, subtle and smooth flavors with a mouthwatering palate wash develop. Opening the bag tantalizing notes of orange, pecan and cocoa are your reward. 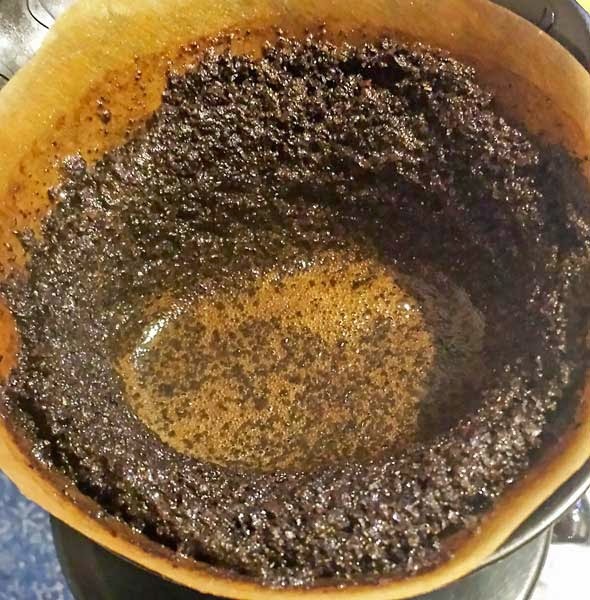 Once the coffee is wet from the pour-over, it gives off more of a blood orange aroma. When you take the first sip, the Death Wish Coffee is bold, yet semi-sweet with the feel of velvet brushing across your tongue. Several cups were sampled for this review using the pour-over method and with each cup the depth of flavors become more apparent. There were flavors of charcoal, blood orange, pecans, cocoa, earth, oak, toasted almonds and lots of caramel. Death Wish Coffee Claims, "We Are the World's Strongest Coffee! Some have called us irresponsible for making this product, we think it's revolutionary". While there is no way to determine the caffeine level doing this review, I can say that this is not just another dark roast coffee. It's smooth, creamy and well balanced, with a smorgasbord of flavors. I can't put into words how much I like this coffee! Give it a try see what you think. You know how you dig and dig and dig until you find something good? Well today I dug up a real gem-in-the-rough, the Quorum Toro. This Quorum Toro about knocked my socks off with it's first half flavors. But let's back up a bit and look at the construction first. To look at, the Quorom Toro looks like just another budget cigar. It has a thick, stout, toothy, Colorado colored wrapper that shows some veins and the seams are raised a bit here and there. Feeling down the body you'll find it's a bit on the soft side, but there's a nice triple cap. Checking cold aromas there are notes of rich fermented tobacco from the foot and the free draw has a flavor mix of oak and cherries. Once the foot is toasted and burning, the first large mouthfuls of medium bodied smoke have a hint of black pepper and leather. The pepper quickly fades as flavors of brown sugar, toast, caramel, mild cherry, and creamy milk chocolate take over to finish the first half. In the second half there's still lots of creamy chocolate, but earth, coffee and charcoal move in to create a long great tasting finish. Sure the cigar's a bit rough looking and the forty-five minute smoking time was a little short, but the flavor mix was amazing. 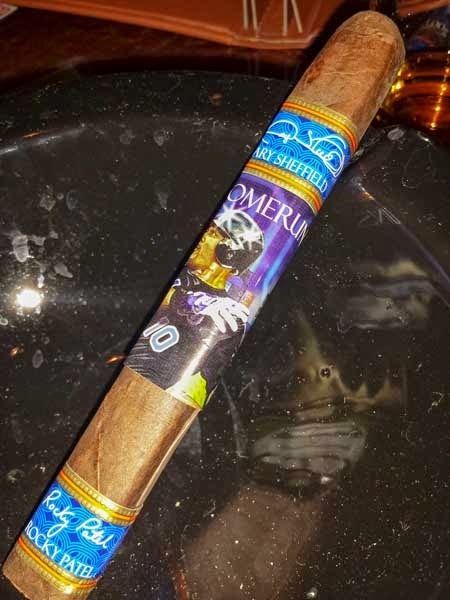 If you're like me and are always on the lookout for a good budget cigar, give these Quorum cigars a try. You can find the full line at NeptuneCigar.com and best of all, the Toro's are only $29.95 per bundle of 20. My initial plans were to let this Allure Connecticut Torpedo From J&D Cigars rest a week, but as you know, "curiosity killed the cat", and after only 3 days I gave in. Once the cigar was out of the cellophane, the high quality construction was even more obvious. The Claro colored Connecticut wrapper contained only the finest of veins and the seams were nearly impossible to see at arms length. Cold aromas from this cigar were nice, the wrapper smelled of slightly sweet tobacco, the foot had a strong aroma of tobacco and spicy cedar, and once the end was clipped the nice even cold draw had notes of tobacco and black pepper. All I can say about this cigar in terms of flavor is; interesting. The first few puffs were a mild black pepper mixed with Oak, then the pepper faded giving way to a mix of nuts and earth. These were the main flavor notes present throughout the entire cigar. What makes this flavor mix so interesting is, I never knew what was coming and when. The flavor mix was continually shifting, one flavor would poke through the quickly fade as another flavor came back again. The firm, light gray, ash hung on until right at the cigars' mid point. When it did finally fall another flavor, brown sugar, jumped in for just a couple of puffs and then disappeared forever. As you can see in the picture, the burn line was very good and the wrapper picked up an oily sheen as the burn line progressed up the cigar. This cigar was a winner! I am not a fan of pepper, but the pepper in this stick was mild and didn't burn my tongue at all. The flavors were not complex, but they shifted back and forth constantly, which was a bit fun trying to figure out what was coming next. I am quickly becoming a fan of torpedo shaped cigars and this one was a pleasure to smoke. As most of you know I am fond of wrappers on the darker side but this cigar was tasty and at this price point I am pretty sure the Allure Connecticut Torpedo From J&D Cigars will become one my new daily smokers! This Rocky Patel Platinum Box-Pressed Toro is one fine looking cigar. To start, the construction of this stick is top of the line. It's box-pressed and covered in an oily, thick, seamless, Oscuro colored wrapper that shows only the finest of veins. The Platinum is packed well full length and finished off with a nice triple cap. Putting the cold foot to my nose there are spicy notes of cedar and after clipping the cap the free cold draw tastes like sweetened raisins. Once the foot of the Platinum is toasted and burning, the first medium bodied mouthfuls of smoke have flavor nuances of chocolate and earth. As the razor sharp burn moves up the body more flavors join in, you can taste cream, stone fruit, toast, lots more chocolate and some espresso. The cigar finishes it fifty-five minute burn with a full bodied flavor mix of cocoa, charred toast and white pepper. It was a pretty tasty mix! Overall this was a fantastic cigar with super construction a nice burn and a well balanced flavor mix. 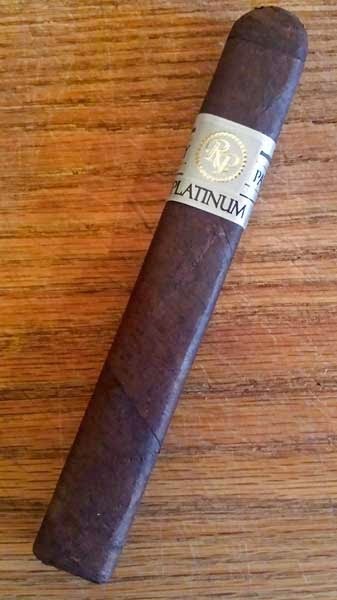 You can pick these Rocky Patel Platinum's up at Famous-Smoke.com as singles, 5-packs or in boxes of 20. 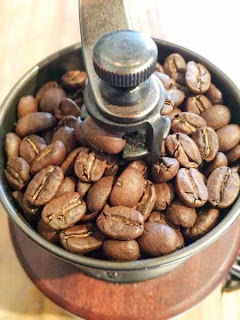 Today we review the Old El Paso Roasting Company, Chiapas, MX Coffee From DP Coffee Club. This Sample came in a 2 ounce, pre-ground sample pack. On the package, it says the sample brews 10-12 cups so instead of doing a pour-over I chose to brew it in my Bella auto drip maker. Once the seal was broken on the bag I could smell rich notes of caramel. Once wet the aroma changed to a sweet mix of plum and pecans. Sipping from the cup, the hot coffee was sweet, with light note of pecan, and a light, brisk mouthfeel. There was also a sharp, overpowering tartness that wasn't supported by a flavor. As the coffee cooled in the cup the tartness changed to bitterness. With the sharp tartness without a supporting flavor nuance I feel this coffee is at the wrong roast level creating an out of balance cup. Perhaps had I ground this sample myself I could have found a better grind to bring out the flavors. DP Coffee Club offers one free sample per household, be sure check out their website. It's been so busy around here, I'm running a bit behind. This Passport Lancero By Crux Cigars came in last month's Cigar Of The Month package from Cigar Train. It's just my 2 cents here, but I think Crux has great logo! Holding the Passport in my hand, it's a beauty. 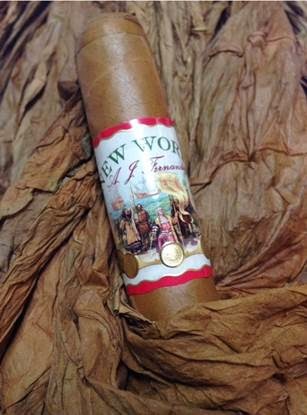 It's packed well full length, the oily, maduro colored wrapper is seamless and contains only the finest of veins. From the cold foot there are notes of rich, fermented tobacco to the nose and once the standard triple cap is clipped, the firm draw has flavors of spicy fruit. As the Passport burned it started with mild bodied flavors of cocoa, corn syrup, toast, brown sugar and nuts. After the first third the cocoa changed to chocolate leaving a nice chocolate aftertaste plus there were nuances of caramel and cream mixed in. 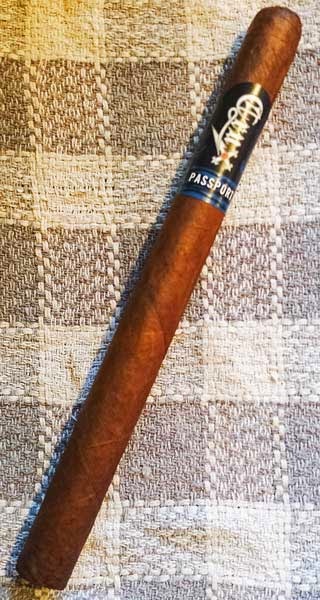 The Crux Passport Lancero finished it's eighty minute burn with a nice medium bodied mix of chocolate, cream and spicy white pepper. Tasty! Although this cigar had a great flavor mix, over-the-top construction, and a razor sharp burn, I have to say the draw was tight enough to hinder the smoking experience of the first half. It did however free up right around the mid point. Even with the draw problems, this cigar is a winner. Well here it is, the first ever contest from CheapAshCigar.com. Many of you already know, I'm just a private blogger, about 90% of what I review, I purchase from local stores or online at full retail prices. Every item in this contest is out of my personal inventory, there are no corporate sponsors. This package is worth about $75.00+ Retail. So here's the deal to qualify. This one will be easy. 1: Comment on this blog post, (not on the Facebook or g+ share, but the actual blog post). The winner will be drawn on Monday 12-1-2014 and via Twitter. If this contest goes well, there will be more. I have some great stuff in inventory. Most of the cigars in this giveaway were purchased locally at Cigar Train or Legends of Fire. Sorry, but this first contest is open to residents of the U.S.A. and Canada only. In the spirit of Thanksgiving Here is more prize for the package! Well I'm making more changes as my blogging evolves. No, not here. Things are going great here, but at DanGumm.com. I've added a new name, IsItWorthIt.guru and am now reviewing lots of every day items. Don't worry, if you have links to cigar, coffee or product reviews posted there, the links aren't changing. danugumm.com is still active and will still answer page requests. Here's the type of review you might find on IsItWorthIt.guru. 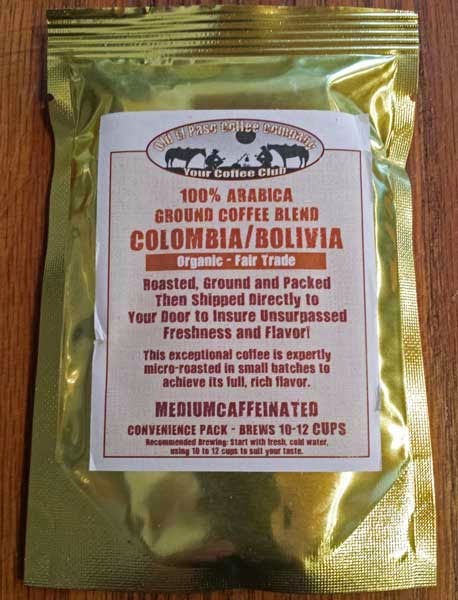 I'm always looking for different coffees to review, last week I obtained a couple samples of Old El Paso Colombia-Bolivia Coffee From DP Coffee Club. I'd never heard of Old El Paso Coffee, so I'm pretty excited to give it a try. This Sample came in a 2 ounce convenience pack, pre-ground. On the package, it says the sample brews 10-12 cups so I chose to brew it in my Bella auto drip maker instead of doing my normal pour-over. From the bag there were deep, rich notes of cocoa mix with earth. Once wet the grounds gave off a nutty, warm bread aroma ( I had to wait until the brewing was done to check this), and the coffee brewed up dark. It was actually one of the darkest cups I've ever sipped. Sipping from the cup, the hot coffee was sweet, with flavors of chocolate, earth, nuts, charcoal and hints of grapefruit. Although the coffee brewed up dark, the mouthfeel was light and slightly brisk with a fresh, cleansing, mouthwatering, palate wash.
With the notes of citrus the acidity matched the flavors to create a balanced and clean cup free from defects. DP Coffee Club offers one free sample per household, check out their website. Over the years, I've gotten away from my blogging roots of reviewing budget cigars, well finally I have a few stocked up and this Casa de Garcia Connecticut Toro is a good place to start. Giving this a cigar a visual inspection, it's a bit rough looking. The stout, Claro colored wrapper shows some medium veins, however the seams are fairly tight. Feeling down the body, it's a bit soft full length. From the foot there's a faint aroma of tree fruit and once the cap is punched I taste the same fruit notes from the free draw. Lighting the cigar was a breeze and I was rewarded with a large mouthful of mild bodied smoke with hints of nuts, fruit and cream. Soon after, brown sugar and a bit of earth took over as the main flavors holding to the mid point where I found about 1/2" of black pepper and barnyard. After a few minutes that faded and was replace by toast, cream, more brown sugar and a hint of pecan. After fifty-five minutes the cigar finished with some bitter oak. At 5.5 x 50 this cigar is a bit smaller than most Toro's I smoke (I had anticipated a forty-five minute burn time), but it's a nice size and a fifty-five minute burn was great. Other than the bitterness in the finish, I though the Casa de Garcia Connecticut Toro had a pretty decent flavor mix, plus the burn was sharp full length. Before smoking this cigar I read some of the reviews on NeptuneCigar.com, some good, some bad, but I just didn't pick up the grassy flavor lots of people mention. I was actually pretty happy with this cigar and think it's a great yard-gar. You can pick these up off the Neptune Cigar web site for a meager $28.95 per bundle of 20 cigars. That's just over a buck per stick, now that's a Cheap Ash Cigar! Today I'm lucky enough to review another Famous Smoke Shop exclusive, the Montecristo Relentless Toro Cigar. The Relentless is another nicely sized 6 x 54 Toro that just feels good in your hand. It comes draped in a silky smooth Colorado Claro colored shade grown Ecuadorian wrapper that's pretty much seamless and vein free. From the foot, the Nicaraguan and Brazilian Mata Fina long-fillers give off a light cedar aroma, while the firm draw tastes like spicy Spanish cedar. Once burning the cigar produces mild bodied flavors of toast, cream and mild white pepper. As the burn moves up the body there are other flavor notes of sugar, toasted marshmallows, raw sugar, mild earth and hints of leather. The Montecristo Relentless Toro finishes it's eighty minute burn in the medium bodied range tasting like coffee with extra cream and sugar. In the first half the burn line was razor sharp, but in the second half it took off a bit, not enough to need a correction though. Overall this was a really nice cigar. It had a well balanced, sweet, creamy flavor mix with a hint of white pepper full length that I really enjoyed, plus I think 54 ring is about a perfect size. Like I said earlier, you can only get these from Famous-smoke.com so log-on and grab a few while you can, they're pretty darn tasty. Davidoff delights aficionados across the globe with an exclusive Limited Edition range of accessories to celebrate the Chinese Year of the Sheep. This new range is the perfect complement to the recently introduced Limited Edition Year of the Sheep Cigars. An elegant porcelain ashtray designed by Chinese designer Chen Jiang, prestige lighters and unique custom-made scissors will give beautiful cigar experiences which befit this time of year. They reflect the very qualities that those born under the sign of the Sheep possess. Belonging to the element of wood, the Sheep is a craftsman, an artist, a devotee of beauty, fashioning a world of harmony and aesthetic pleasure. For in the Sheep’s eyes, happiness is other people’s happiness. The Sheep love to see their own love of life reflected in the faces of those around them as well as the objects and things which surround them. All these Limited Edition accessories celebrate the personality of this distinctive sign. Those travelling the world before returning to China for the celebrations may also find these to be the perfect Christmas gifts – to fill their time beautifully. “The Zodiac sign of the Sheep has many common values with Davidoff. The appreciation for craftsmanship and the sense of refinement and style which brings joy to others are at the heart of everything Davidoff believes in,” says Charles Awad, Senior Vice President Marketing and Innovation of Oettinger Davidoff AG. In keeping with this belief, these exclusive accessories have been lovingly crafted using the rarest and most precious ingredient – Time”. Davidoff sought out the Chinese designer Chen Jiang to come up with a concept for a new collection of Chinese celebration and occidental luxury. Due to his unique profile and double culture between China and the USA, he is a true asset to the company. Like any craftsman in any discipline at Davidoff, it is the time which Chen Jiang has invested in his art – 18 years of experience in the fields of design research, furniture and lighting for prestigious international brands. This oversize Davidoff porcelain ashtray is a unique gift for a harmonious home. It is made in Limoges, the heart of the French porcelain industry, and delicately decorated with a mix of 12% gold, grey and red, and twisted and tapered surfaces evoking the horns of the Sheep. Its spacious appearance will appeal to the Sheep’s generous personality, so relevant at this time of sharing. 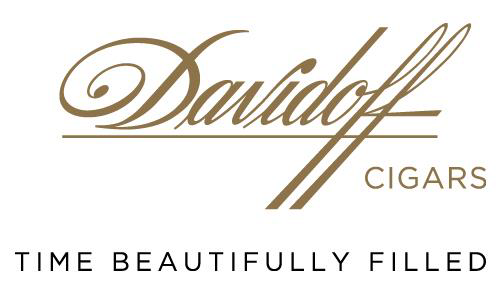 Davidoff has created its new prestige lighters with the utmost care. The base is made of one piece of brass and the tank is part of the lighter’s body, ensuring there are no leaks, and no plastic tank. The brass is cut into the exact shape of the lighter, and what’s more, the lid is split up from the body, ensuring a perfect fit and unique match. The harmony which characterises the Chinese New Year is symbolised in the way the two opposing gas streams come together to form a unique fan-shaped flame, allowing cigars to be lit evenly and efficiently. The lighters are available in palladium with a design of horizontal lines, or in a gilded finish with an accolade design. They arrive in an elegant red pouch immaculately tailored with the Year of the Sheep design. Finally, the perfect accessory for the refined and reimagined Piramide shape of the Year of the Sheep Limited Edition cigars: the Davidoff Special Edition scissors, available in a red leather pouch. Forged from stainless steel, the gold-plated clippers are decorated with a stylish laser marking inspired by the Year of the Sheep. The large blades can be used to cut cigars with a head gauge of up to 23 mm/58 RG not just with ease, but with precision. The Davidoff Year of the Sheep Accessories will be available at Davidoff Appointed Merchants/Depositaires and at Davidoff Flagship Stores worldwide from December 8th 2014 onwards. So here it is, the Allure Habano Torpedo From J&D Cigars. Construction of this cigar was flawless. As I examine the cigar's body I can see it only contains the smallest of spider web size veins, it has nearly perfect seams and it's packed just right the entire length. This cigar looks like it could easily carry a $10.00 or higher price tag. 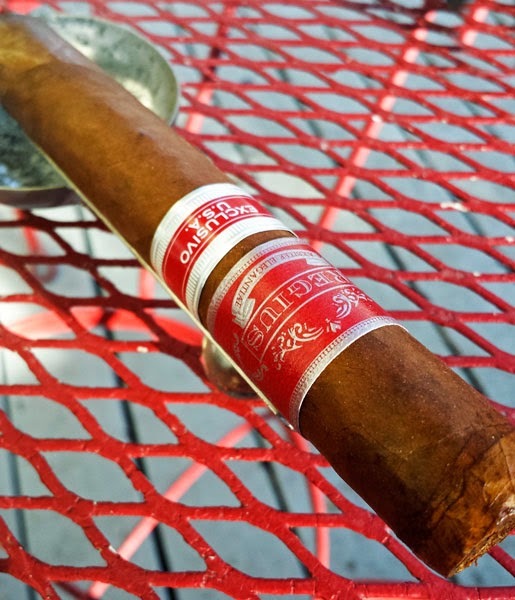 The cold aromas from this cigar are nice, from the foot I am finding a hint of sweet fruit and tobacco while the Colorado Claro colored wrapper has a nice sweet tobacco aroma. Once the end is clipped The perfect cold draw gives me a nice shot of spicy tobacco. After toasting the foot with my trusted single jet, the first flavors I can taste are a mild, dry, mix of black pepper and earth. Just as I get these flavors jotted down in my notes, a nice mellow, creamy sweetness is pushing away the pepper, then suddenly here comes coffee, then earth mixed with a bit of oak. This is amazing, it seems like the flavor changes with every two or three puffs. The flavor mix continues to dance around every few puffs until I reach the final third. In the final third I am surprised by a nice sweet creaminess that nearly dominates the flavor profile and it actually hangs around for more than a few puffs, giving this cigar a super strong medium bodied finish. Overall this cigar is a real winner. It has a great burn, good smoking time at 60+ minutes, nice flavors and top of the line construction, plus a price point that can't be beat. 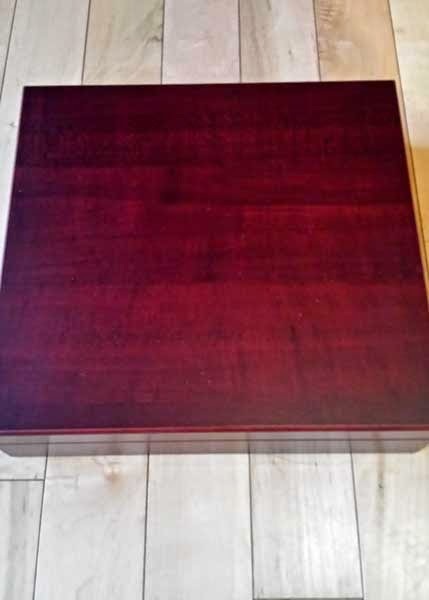 CheapHumidors.com has these on sale at $14.97 for a pack of five. That's a deal! Here's a coffee that's been on my to-review list for some time, Death Wish Coffee's Valhalla Java Odinforce Blend. Although this sample came pre-ground, I used the pour-over brewing method with .6 oz. of coffee to 10 oz. of water, 30 seconds off the boil. Once the bag is opened the ground coffee has a deep, fragrant aroma of earth and cocoa. As hot water is poured over the grounds and it begins to bloom, the aroma changes to mix of sweet stone fruit and pecans; these same aromas radiate from the cup once brewing is complete. Even though this blend was created for the hard hitting guitarist, Zak Wylde, it's a hearty brew fit for Odin himself. The flavors are bold, yet balanced, with a smooth, sweet, syrupy mouthfeel. Tasting the Death Wish Coffee Valhalla Java Odinforce Blend, there were complex flavors of charcoal, pecans, caramel, cocoa, stone fruit and toast. Hot, the coffee starts in the medium body range and finishes full bodied as it cool, with a pleasant chocolate aftertaste. This sample also created a clean cup. Overall this Death Wish Coffee produced a great cup with bold, rich and well balanced flavors. Check out DeathWishCoffee.com to see their entire line. I bet they have a roast for you. I saw a picture of this Black Lotus Robusto from Dominion Cigar on Twitter the other day and just had to have one. I tweeted in reply and Dominion Cigar put one in the mail for me that day. Their picture was much better than mine, but I think the bands on this cigar are pretty neat! Giving this Black Lotus the once-over, it's covered in an oily, near veinless, maduro colored wrapper. The wrapper is seamless, and the firmly pack cigar is finished with a triple cap. Testing cold aromas, there are notes of fruity fermented tobacco to the nose and the firm draw has flavors of spicy raisins. After clipping the cap and lighting this great looking cigar, the mouthfuls of medium bodied smoke had nuances of powdered cocoa. As the razor sharp burn line moved up the cigar a deep oil sheen developed on the wrapper and more flavors moved in. Flavor notes developed of sweet raisins, toast, nuts, toasted marshmallows, ripe plum, leather, caramel, sugar in the raw, earth, charcoal, wheat straw and oak. Nice! The Black Lotus finished it seventy-five minute burn with a mix of charcoal, coffee and chocolate. Overall this was a smooth, great tasting cigar with a complex flavor mix, a long smoking time, and long, rewarding, flavorful finish. I would like to thank Dominion Cigar for providing this sample! 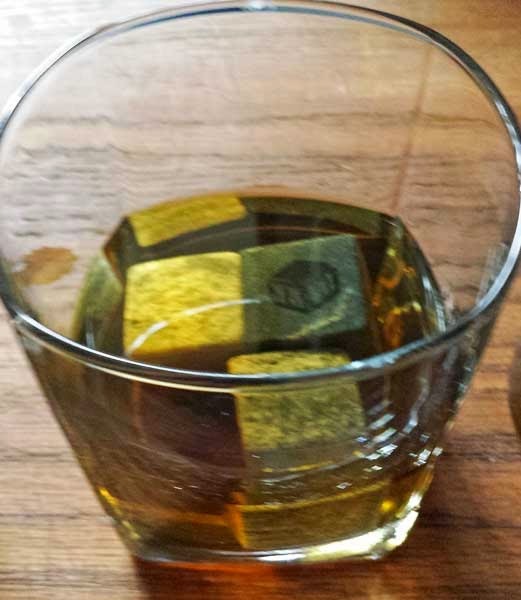 I like my whiskey "neat", but at the same time cold. Until now that problem was solved by keeping whiskey bottles in the freezer. That was pretty good solution most of the time but there isn't always time or room, plus the minute the whiskey hits the glass it starts to get warm. About a month ago I came across the SipDark.com website. After a few minutes of reading I thought to myself "These are pretty neat looking and I bet they really work". 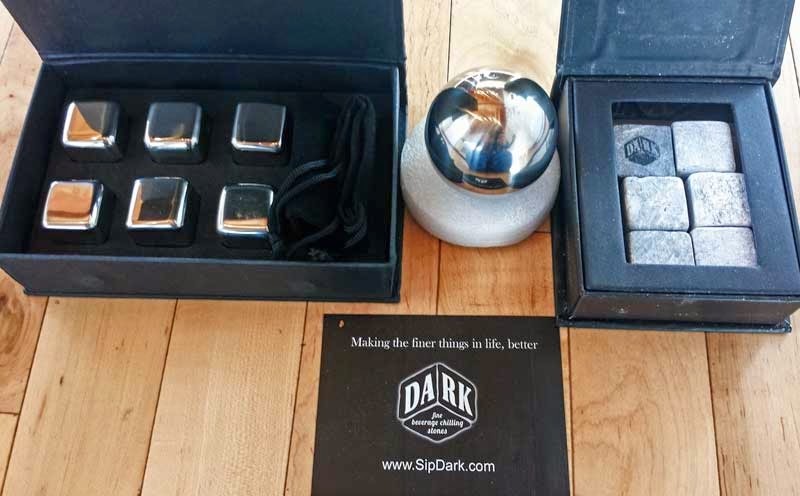 To make a long story short, I ended up with three SipDark products to review; Whiskey Stones, Steel Whiskey Stones and a LoBall Whiskey Sphere. So, let's get down to business and see how well each of these products performed. For these tests I measured out and poured 2 ounces of whiskey in each glass. Temperature readings were taken of each sample after 5, 15 and 30 minutes. Each of the SipDark products were in the freezer for 6 hours before testing. Whiskey Stones: Sets of 3 or 6, custom engraving is available. Cut from natural soapstone, this set came packed in a box of 6 - 1" stones. As you can see one of the stones has SipDark's logo engraved. Temperature readings, 3 stones used. These worked well with only a 5 degree increase over 30 minutes. Steel Whiskey Stones: Sets of 3 or 6, custom engraving is available. Made from stainless steel these 1" stones are polished with rounded edges and come in sets of 3 or 6. The set of 6 comes boxed and include a velvet carrying bag. The steel stones continued to cool down the whiskey after the first 5 minutes with a 2 degree drop after 30 minutes. 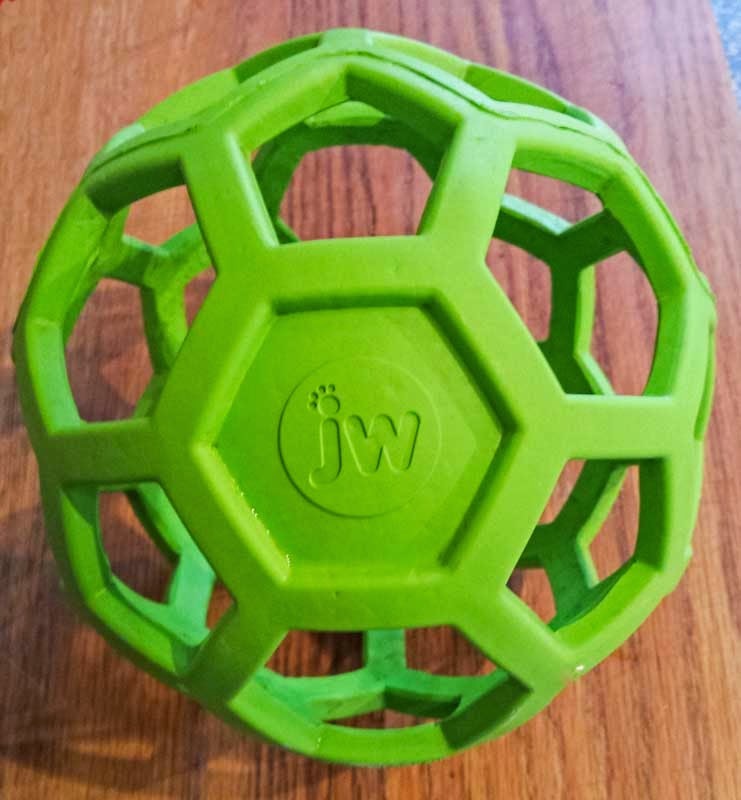 LoBall Whiskey Sphere: Custom engraving is available. Made from polished stainless steel, the LoBall Spheres are filled with a non-toxic liquid with a lower freezing point than water. Temperature readings: 1 sphere used. Again the sphere continued to cool after the initial temperature reading and held the lowest temperature overall after 30 minutes. 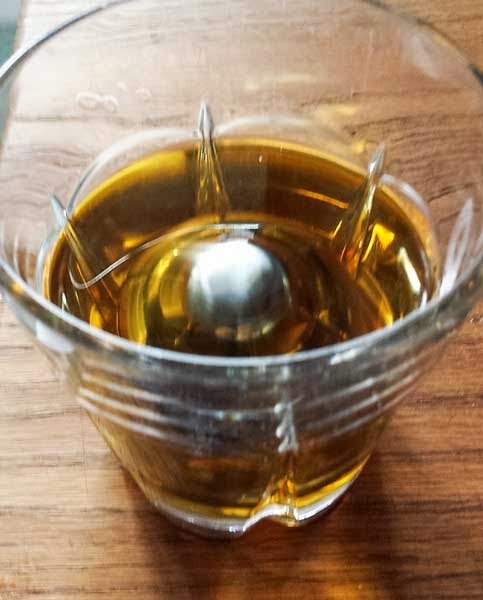 All of the products did a great job, but the LoBall Whiskey Sphere was the clear winner being the quickest to cool, and keeping the whiskey at the lowest temperature. Before reading this final test, SipDark recommends 1 stone per 1 ounce of liquid. I am clearly pushing the limits to see how they handle it. 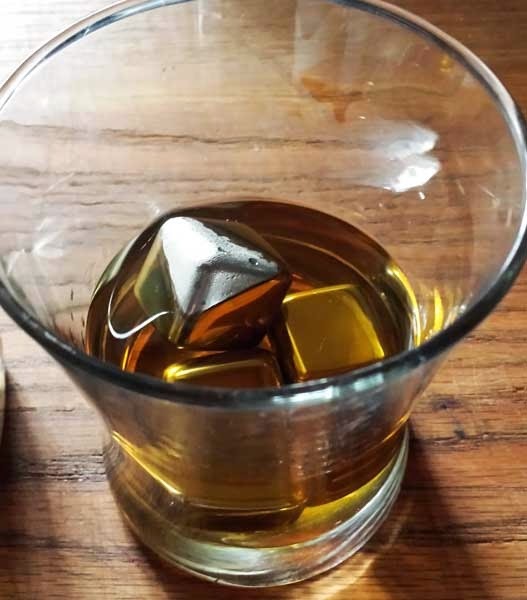 As a final test, I used 6 Whiskey Stones, 6 Steel Whiskey Stones and the LoBall Sphere in separate glasses holding 12 ounces of diet Pepsi compared to about the same volume of ice. The results were pretty interesting. The LoBall Sphere and the Steel Whiskey Stones were the winners getting the drink colder, faster, plus at the 30 minute mark, nearly all of ice had melted diluting the diet Pepsi. Even though I stretched the limits in the final test, these products from SipDark well exceeded my expectations and were solid performers, plus they look great in the glass. I like my whiskey cold, but without ice and to taste like whiskey, all of these products were up to the task. You won't go wrong with any of these products! Drop by the SipDark website and check them out. Well, the journey through this new line of Exclusivo U.S.A. Cigars from Regius Cigars draws to a close with this Toro Extra. Let me say, this may be the most interesting cigar of the line. This Regius Cigars Exclusivo U.S.A. Toro Extra, starts out mild and sweet then BAM, about two thirds through it hits with a full bodied mix of bold and earthy flavors. But, lets back up a bit. Looking at this Toro Extra the quality of construction radiates from the cigar. The oily, smooth, Colorado Claro colored wrapper contains only the finest of veins and it's rolled on with seamless precision. Feeling down the body, the cigar is packed well and the cigar has a neat little pig-tail cap. From the foot there are aromas to the nose of fermented, fruity tobacco and the firm cold draw tastes like spicy Spanish cedar. After clipping off the pig-tail cap, toasting the foot and lighting this beauty up, the first puffs are mild bodied with a sweet Chai tea flavor. In the first two thirds there are flavor nuances of nuts, coffee, raw sugar, leather and toasted marshmallow. To this point the burn has been razor sharp and the cigar produces a huge volume of smoke. In the final third, everything about this cigar changes. The body jumps right into the full range and the sweet mild flavors are replaced by deep rich notes of earth, damp leather, molasses, charcoal and black pepper. At this time the burn takes of and gets pretty wavy, bad enough it needed a quick correction. The cigar finishes it's seventy minute burn with a tasty, very full bodied mix of charcoal and molasses. On the Regius Cigars Exclusivo U.S.A. web site it says, "This cigar is a more full bodied blend which develops in flavour, reaching a crescendo two-thirds of the way through. Smooth until the end, the cigar is long, rich and satisfying". Boy did Regius Cigars get that right. Overall this was a really nice cigar. It had top of the line construction and a great tasting, complex flavor mix. This Exclusivo U.S.A. Toro Extra is a cigar everyone should experience! Last week I launched a new WordPress site and Chose SecureWebs.com as my hosting company. If you're like me you want your WordPress site hosted with a company that not only understands the platform, but has the backbone, servers and up-time to give your readers a quality experience. Next time you're looking for a quality WordPress host try SecureWebs. Opening their doors in 1995 SecureWebs is one of the first companies to offer dedicated server hosting and shared virtual hosting. They were also the first hosting company with enough vision to offer shared .Net hosting back in the day. Sure, there are bigger hosting companies that have slick online setup forms and will sell you what ever you want, plus lots of extras but SecureWebs knows hosting and they will sell you just what you actually need, with world class support and at a fair price. SecureWebs builds all there servers from scratch using high-quality, top-of-the-line components like SuperMicro motherboards, dual or better Xeon processors, ECC DDR 3 memory plus reliable solid state drives to keep your data safe and your site feeding out pages quickly. At SecureWebs you can co-locate, rent dedicated Windows or Linux servers, or get shared hosting on either Windows or Linux. All shared accounts come with email at no extra cost plus tons of other features. Their basic shared plan for $8.95 comes with web based email, a free domain name the first year, web base control panel and 2 MySQL data bases just to hit the highlights. Check out SecureWebs.com then give them a call. They'll help size your account to best meet your needs without breaking the bank! Last night Northern Quest Casino held a Gary Sheffield HR 500 Cigar event in the Legends of Fire Cigar Lounge. Gary Sheffield himself was there promoting his newest line of cigars. It was a fun night, there was a great turn out plus Blake and Brittney put on a really nice event. Paula went along and we picked up a lot of great cigars and stuff that Gary autographed for us--be on the lookout, I feel a cigar contest coming on the next couple of weeks. This limited edition Gary Sheffield HR 500 by Rocky Patel was created to commemorate Gary's 500th home run. We had the honor to smoke and purchase a special box-pressed toro version of this cigar. Well, let's talk about the cigar itself now. Like I said, this was a box-pressed toro covered in a hearty Colorado Maduro colored wrapper. About 70% of the cigar is covered with bands, but once they're removed you can see the seams are tight and the toothy wrapper only has a few small veins. The cold foot had an aroma to the nose of cocoa, while the airy cold draw had notes of cocoa and oak. After toasting and lighting the foot, the cigar produced plumes of mild bodied smoke with flavor notes of leather and cocoa. As the burn moved up the body there were few more flavors in the mix; brown sugar, white pepper, oak, chocolate and charcoal. The HR 500 finished it's sixty minute burn with a nice burnt mocha (cream, chocolate and charcoal), flavor mix. Overall, this was a nice cigar! The burn was a bit wavy in the first half but it never needed a correction and although the flavor lacked a bit in complexity, the flavors were nice, especially the burnt mocha finish. Paula enjoyed smoking her cigar too, that says a lot for this cigar. I'd like to thank Gary Sheffield and Legends of Fire for putting on this great event. You can find these cigars on-line a Famous Smoke Shop, in 5-packs or boxes of 20, give them a try! 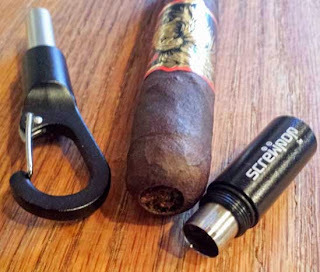 I love cigar tools and here's a good one, the Screwpop™ - Cigar Punch 2.0. I've only had it a few days, but that's enough time for some serious testing. 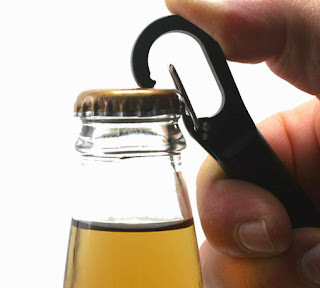 This Cigar Punch 2.0 is pretty neat, not only is it a quality cigar punch, but it pulls double duty as a bottle opener. Besides that, it's just handy, you can use the carabiner style latch and hook it to almost anything: keys, belt loops, zipper eyes, fishing vest, tackle box, golf bag etc. I think you get the idea. OK, so it's handy, but how well does it punch a cigar? 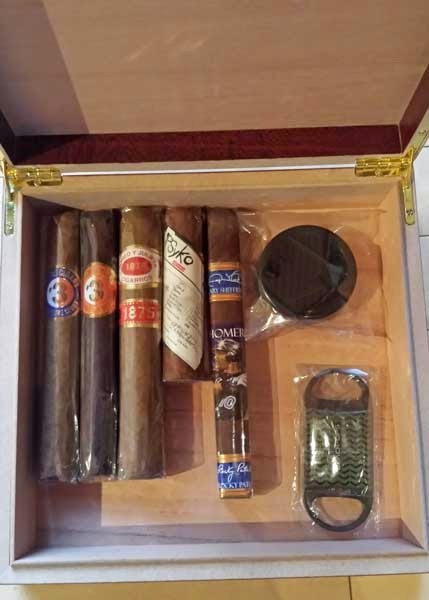 To answer that question I've used the Cigar Punch 2.0 to punch over a dozen cigars with wrappers ranging from finest Connecticut's to thickest Oscuro's. I punched all these cigars and didn't crack or break one single wrapper! To be honest I was a bit worried about that before I began testing because this punch is pretty big, it cuts a 3/8" hole. But it's sharp and does a great job. One of the most exciting things about the Screwpop™ - Cigar Punch 2.0 is how simple it is to use. Just unscrew the cutter from the bottle opener, punch your cigar and screw it back together. The inner rod pushes out the cutting and your good to go again. Since it's constructed from aluminum and stainless steel, it's rust resistant and durability shouldn't be an issue. I like this tool so much it's going with me to the event at Legends of Fire tonight so I can show it off! 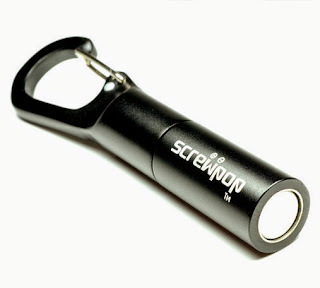 You grab your own punch directly from Screwpop Tools website for only $14.95. While you're there check out their other neat products! There are a couple key points to this tool that I forgot to add. The bottle opener is one. I did test it on a couple of beers and it worked great. Plus there's the clasp. I make use of the clasp by attaching the cutter to the lanyard on my travel humidor. That way it's always handy and ready for action. Basel/Buckhead, Atlanta, October 2014. Buckhead, the affluent uptown district of Atlanta, Georgia, will welcome a Davidoff Flagship Store developed in accordance with the new globally standardized design and concept of “Davidoff of Geneva – since 1911” at the Buckhead Atlanta shopping district, slated to open in Spring 2015. Davidoff partnered with Oliver McMillan to integrate Davidoff’s new retail concept into the luxury retail and high end cuisine, shopping and dining district in the heart of Buckhead. The new Flagship Store will feature a luxurious environment and guest experience covering nearly 3,000 square feet, split into five carefully designed areas. Throughout each space, the interior and architectural design will be inspired by the traditions of the Dominican Republic, where much of Davidoff’s production and many of its employees are based. 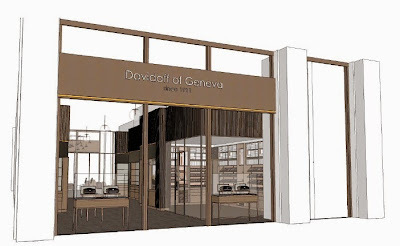 “We are delighted to open up a new ‘Davidoff of Geneva — since 1911’ Flagship Store in Buckhead,” says Jim Young, President of Davidoff of Geneva North America. “This new store will feature a sizeable walk-in humidor, a beautiful retail space where we will display a selection of the finest accessories, and an inviting 1,000+ sq ft cigar lounge, all brought together through our new global retail design concept. It also includes a VIP member’s lounge and a conference room for clients wishing to conduct meetings in a premium cigar environment”. The Davidoff Flagship Store location will be complemented by 275,000 sq ft of luxury and best in class retail, luxury residential, fine dining and entertainment in the newly opened Oliver McMillan luxury-shopping destination. Spanning six city blocks in historic Buckhead Village, Buckhead Atlanta is designed to fit seamlessly into the existing area with pedestrian friendly streets. Davidoff Flagship Stores. Henri’s son, Zino Davidoff, learned the trade from the ground up. decades. Zino Davidoff transferred the family business to the Oettinger Group in 1970. Republic, Honduras and Nicaragua to its worldwide network of 65 Davidoff Flagship Stores. “Davidoff of Geneva – since 1911” Buckhead, Atlanta: Storefront Rendering. 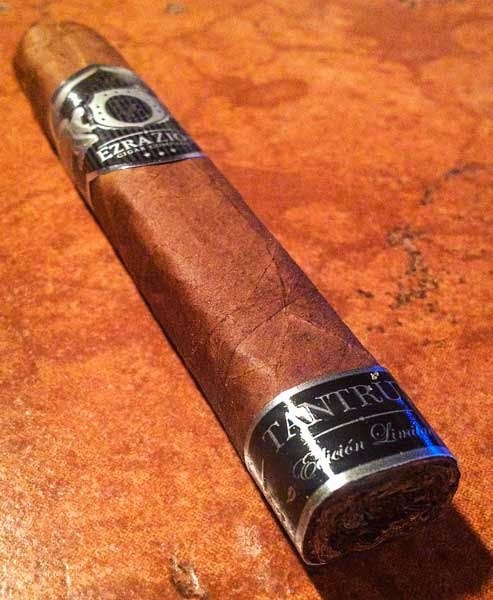 This Ezra Zion Tantrum Prensado Penqueno is another sample provided by Ken from the Ezra Zion Cigar Company which by the way is one of the lines included in the House of Emilio best of the boutiques. 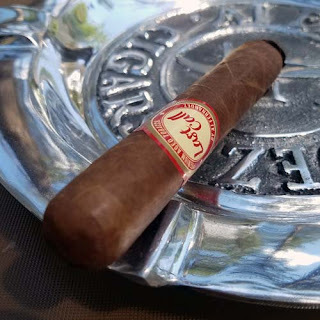 I am pleased the Ezra Zion Cigar Company asked me to review their products and would like to thank them for the opportunity to enjoy their fine cigars. This was another cigar that my preconceived notions nearly had the better of me. I have read a few other reviews on the Ezra Zion Tantrum over that past couple months and they led me to believe that I had a pepper bomb on my hands. If you have read many of my reviews, you know just how much I like pepper and if you are a first time reader, let me share it with you too. I hate pepper! Now I don't mind a bit of pepper but, if it burns my tongue I'm done. So now you understand my apprehension about smoking this cigar. Additionally, I have discovered my palette is spot on with some reviewers, a million miles away from others. With this cigar and review I once again am not following the norm. I'll sum this cigar up right here, then tell you about the rest, but to paraphrase, this cigar was for lack of a better term, simply delicious! Well anyway back on task here. Overall construction of the Tantrum was superb. Feeling down the body, it was firm, in fact very firm, with no obvious soft areas, the wrapper contained only the finest of veins and was rolled on with nearly invisible seams. Cold aromas from the body and foot were that of toasted tobacco and once the end was clipped the free cold draw had the same flavor notes. Well so far so good, my pepper fears were fading. I toasted the foot with the first match and then lit it up with the second. The first two draws had a good dose of black pepper and I instantly thought the others may have been right. Well I jumped to that conclusion to soon, that was the end of the pepper for the entire cigar. The most interesting thing about this cigar for me was that I could not pin down a flavor in the first third. Don't get me wrong the cigar was delicious, but I just couldn't come up with a reference other than it was slightly sweet. In the center section a more noticeable flavor mix showed up. I could taste a shifting mix of sugar, brown sugar, earth, oak and burning oak. The light/dark semi flaky ash held until the mid point. The burn was a bit wavy in the first half but never enough to correct it. In the final third the flavor shifting settled down in the final third giving me a tasty full bodied finish of brown sugar mixed with earth. Overall this was a difficult cigar for me to review due to my preconceived ideas and not being able to discern some of the flavors, but boy was it worth it! I loved this cigar for the strength and the flavor mix. This was the second stick I have reviewed from the Ezra Zion Cigar Company and it too was a winner! My suggestion, give this cigar a try and see what flavors develop for you! 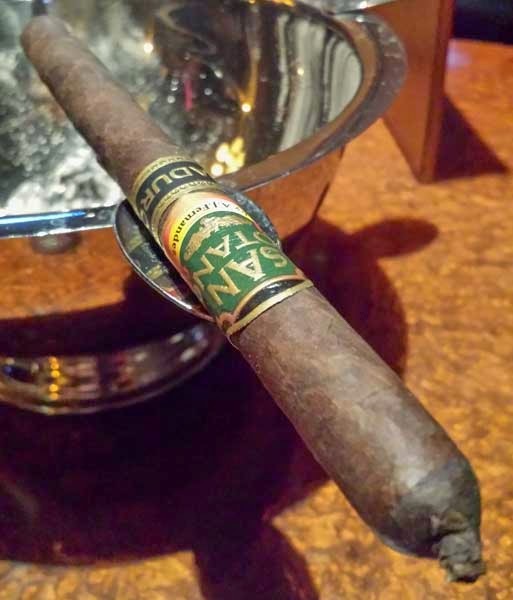 Like I said, it was cold the other day, it's even colder today, and here's another cigar I picked up from Legends of Fire inside Northern Quest Casino, the San Lotano Maduro Lancero from A.J. Fernandez Cigars. Firmly packed and covered in a stout, toothy, Oscuro wrapper, this is one nice cigar. Surprisingly, for such a stout wrapper, it only contains a few fine veins and since it's a Lancero, it's finished with the classic pig-tail cap. Testing the cold cigar, the draw is a bit firm, but OK, with the same flavors found in foot, cocoa. Cocoa and black pepper are the initial flavors once the cigar is burning, but the pepper quickly fades leaving behind just the cocoa. The best way to describe the medium bodied flavor mix is to call this cigar a chocolate bomb. Besides the chocolate, there were nuances of cream, brown sugar, leather, caramel, toast, dark chocolate and some scattered mild black pepper. There was a long finish and a flavor battle throughout the last third. Burnt mocha hit right about the band, but that quickly changed as some full bodied black pepper hit for a few puffs. The pepper was replaced by cocoa, then the burnt mocha came back lasting to the nub. A sixty-five minute smoking time added to the great construction, complex flavors and razor sharp burn make this cigar another winner from A.J Fernandez. If you don't smoke the cigars A.J. creates, you are really missing out. This sample of Indian Arabica from Monsoon Coffee & Tea arrived in the mail a couple of days ago and since Monsooned Malbar is one of my favorites, I am pretty excited to give this roast a try. Once the bag was opened there was an immediate aroma of nuts and cocoa radiating from within. After grinding the medium roast beans, the nutty cocoa aroma was still present but there were added hints of spice. 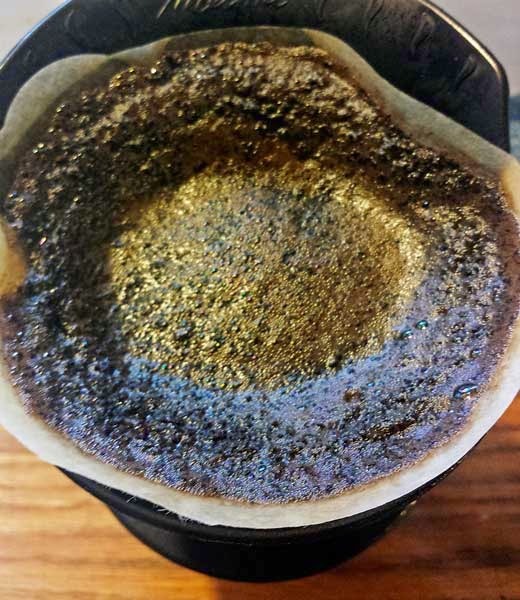 For this review I used the pour-over brewing method and just to hone my skills, I did a cupping. Normally I don't do much cupping. Why? because I'm a coffee sipper, not a coffee roaster and I want pass on to you how a coffee sips. Doing the pour-over, the wet coffee gave off pleasant notes of sweet, warm bread with that same hint of spice found earlier. From the cup, the first sips had notes of sweet nuts and cocoa. As the coffee cooled, the notes of cocoa became more pronounced, the natural sugars develop and notes of earth appear. Doing the cupping, the wet coffee had the same notes of warm bread, nuts and spice, but it all changed once the crust was broken. After the break, spice became the prominent aroma, with subtle notes of coco and nuts underneath. Sipping from the spoon is where the real difference appears, while the cocoa is still present, the nutty flavor changes to pecans, plus there is a pleasant lingering nutty pecan aftertaste. 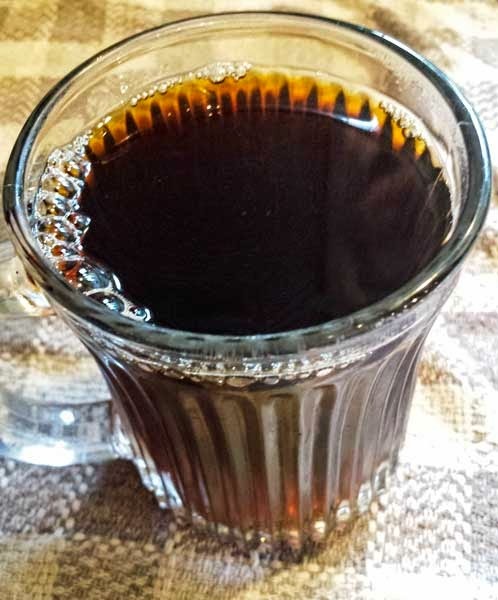 Hot, this Indian Arabica coffee, is sweet, slightly brisk, yet well balanced with zero tartness or bitterness plus there's a clean, refreshing palate wash. As the coffee cools, a buttery smooth syrupiness develops, the sweetness increases and the flavors deepen. I found this Indian Arabica from Monsoon Coffee & Tea Company to produce a clean cup with no defects and an overall complex and rewarding sipping experience. Give these beans a try, you won't go wrong! Of course I'm a fan of Espinosa Cigars, I think everyone should be. I'm pretty excited to smoke this new 601 Steel, exclusive to Famous Smoke Shop, in the Girder (Toro), vitola. To start things out, this is one nice looking cigar. The steel and black band creates a nice contrast point against the dark Oscuro wrapper. Holding the cigar in my hand, it's packed well full length, the oily Oscuro wrapper is hearty, but contains only fine veins and the seams are tight. From the cold foot there is an aroma of chocolate covered raisins, while after clipping the triple cap the free draw tastes like fruity chocolate. After toasting and lighting the foot, the first medium/full bodied puffs produce large mouthfuls of smoke tasting of cocoa and raisins with an added dash of black pepper. I should also mention that the Oscuro wrapper left a nice chocolate aftertaste on my lips. In the first half the burn was razor sharp and the wrapper developed a rich oily gloss. There were other flavors of chocolate, damp leather and white pepper. In the second half the burn got a bit wavy, but not bad enough to correct, the body moved into the full range and there were other flavors of molasses, charcoal, black pepper, plus some mocha. The 601 Steel finished it's sixty minute burn with a tasty flavor mix of burnt mocha with a bit spicy pepper. Overall this 601 Steel was a darn nice cigar. It had a rock-solid flavor mix, top-notch construction and a pretty good burn. You can only pick these up from Famous Smoke Shop but at $7.54 for a single, it's a pretty good cigar value . Try them out, I don't think you'll be disappointed.